- Main part found on another Madison release, Cajun Tornado. - Tracks from July 3, 1976 are taken from Rockin' Across Texas by FTD. Another release from Madison. Their tempo is high and this time we are offered a double CD containing large parts of what happened in Tarrant County Convention at the evening of June 3 1976. 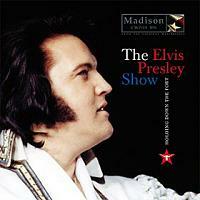 The main event, the Elvis part of the show, is found on CD-2. A large part of this show has already been out on another Madison CD, namely Cajun Tornado. It has better sound on this new release, fortunately! Still, it is pretty strange that the same label release the same show twice, just some years in between the first and the second time. Even though this is not one of those remarkable shows, it sure is a pleasant listen! Elvis is in a very good, infectious mood. 'See See Rider' is a steady version, even with severe feedback problems during the first part. Elvis later asks Bill Porter if he wants to eat the microphone. The tempo and good spirit continue with 'I Got A Woman/Amen'. 'Love Me' is lazy as always! Elvis then announce 'Let Me Be There', before he realizes that he mixed up this with another Newton-John song 'If You Love Me'. Again Elvis delivers. He slightly phrase the song a bit different that normal, not perfect, but somehow it works. 'You Gave Me A Mountain' is a normal good version, Elvis rarely failed on this one. Then it is time for the tedious run-through of throw-aways. First out is 'All Shook Up', then 'Teddy Bear/Don't Be Cruel'. However a very good version of 'Heartbreak Hotel' - including some ad-libbing - has Elvis breaking out of the boring routine. 'Help Me' is just so-so, but certainly better than most of the later versions of this song. 'Jailhouse Rock' is taken from the official release of the Ft. Worth concert exactly one month later. The original version is tagged onto the end of this CD; unfortunately the tape is damaged on this spot in the show. 'Fever' is a song I very often skip; also here...however one listen just for the sake of this review proves it to be, eh "skip-able". I never jump over 'Polk Salad Annie', however. This song worked perfectly in 1970 to 1972 and 1976 to 1977. In later years mostly because of the bands achievement, but Elvis tags along to the very end. After such an effort it is surely time to catch his breath and introduce the band. A short version of 'Early Morning Rain', a brief 'What'd I Say' and a behind the head version of 'Johnny B. Goode' is followed by the ever tiresome drum solo. Elvis immediately approves the licks from Jerry Scheff on his fender bass. He then shows lighthearted mood when he realizes that he just introduced Tony Brown as Shane Keister. Three months ago, it would have been a hit as Shane Keister worked with Elvis during the short March tour in 1976. Continuing in the same lane, Elvis introduces David Briggs as Floyd Kramer, but this time the mix up was deliberate! 'Love Letters' runs too slow, just like it often did! A pity, because otherwise it is a perfect rendition. After band introductions Elvis sings 'Happy Birthday' to Bruce Jackson, before two "mike overload" versions of 'Hurt' continues. On the second version Elvis takes the song a step higher up, almost loosing his breath. The last tracks are again taken from the official release of the July 3rd show. A snippet of the original version of 'Hound Dog' can be found as the last track on this CD, lasting only a few seconds before the tape recorder was switched off. Overall this is a nice concert in good sound. The soundboard is not top-notch as it is slightly hissy all over. But the sound is dynamic and overall well-balanced. Accompanied with a nice booklet, you can't go terrible wrong buying "Holding Down The Forth"!